The field of harmful coercive relationships is huge. It stretches across all kinds of family and other groups. But it is all over the place. No one can have read all the shelves and webpages full of great description. Quantity has to do while we wait for a missing quality. The quality it lacks is the coherence of a good integrating theory. Now the exciting news is that Dr Alexandra Stein’s new book condenses that vast body of knowledge around the backbone and beating heart of a powerful integrating theory. No surprise … that theory is attachment theory. It fits like a glove! You don’t need to look for any other theories. Attachment theory derives from our understanding of intimate family relationships. Cults function by replicating the most disturbed family attachment patterns to do their dirty work. Leaders of cults often name themselves as if they were parents or siblings. 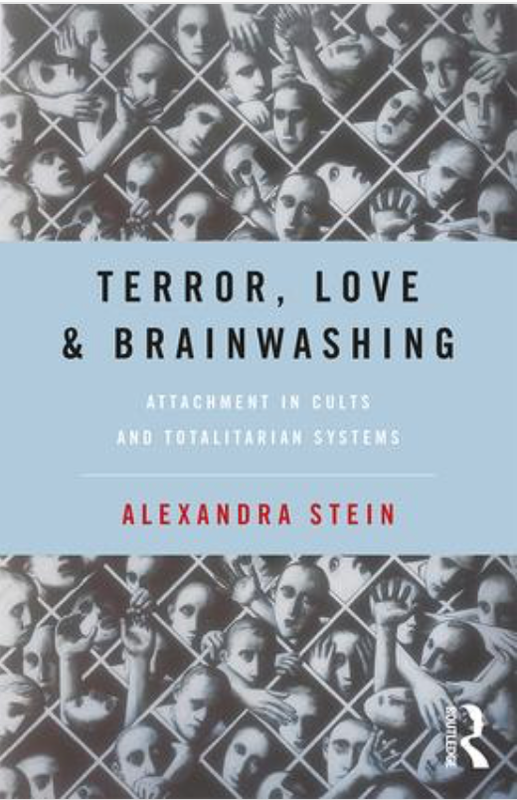 So Alex Stein’s Terror, Love and Brainwashing: Attachment in cults and totalitarian systems is definitely not just about cults. This new backbone and heart unites and carries the whole of our huge field forward. You will learn – from this book on cults – about harmful coercion everywhere, in all kinds of situation, including of course coercive patterns in families. Read this book if you want to understand harmful coercion in families. She shows how disorganised ‘fright without solution’ attachment patterns are used by charismatic authoritarian cult leaders to acquire the coercive relationships over their followers that they thrive on. It’s the same abuse of attachment in families except that the attachments don’t need to be created – they’re there on a plate. This book is so beautifully written that reading it slips down as easily as if you were chatting with Alex over a cup of tea in your house. You keep wanting to stop her to say: Just a minute, what did you say? Wow – that’s good! Could you say it again please? … Luckily, there she is on the page. You can re-read her as often as you like! As well as an up-to-date summary of the field from a very well-read thinker, you get the benefit of Alex’s own experience of being in a political cult. Until the field matures, unfortunately the commonest way to discover it is to be pushed in the deep end. And you get Alex’s own comparative research on cultic and non-cultic groups on top of that. The book’s chapters step you through the stages of being drawn in out of your ordinary life, then to slide down the slippery slope into the hold of the hell of coercive terror, love and brainwashing. This ‘fright without solution’ may indeed really end with your physical as well as your emotional death. The nightmare is real. But not always without end. All the way through, Alex shows how attachment theory enlightens us on how this hell of ‘love’ and terror operates. As ever, the alienation experience is key. The coercive system promises but prevents genuinely safe attachments within the group. It closes any escape hatches to healthier outside relationships or information. With the candle of attachment theory, you see how there can be escape from this hell, how outsiders can help that escape. The chapters get better and better until the last one gives us a vision of how our new world could be. It’s a kind of anthem of hope and humanity. But this is no rosy romantic vision. We see this vision based in the solid reality of a major coalescence of universal research and rationality about how relationships work (for good or evil) and the underlying neuroscience within the framework of attachment theory. That world is built on safer joyful relationships. That world will spot and stop the hellish ones before they get going. The magic we receive here transforms our usual reductionist focus – on individuals and concrete incidents, things we can see and prosecute – into seeing relationships – the good, bad and ugly – just as or even more vividly than concrete things. Alex gives us such a rich grasp of intimate human relationships – how they work well and how they can be turned into hell – that the vision does not evaporate into fog. So we can know where we’ve been. We can know where we’re heading. We know what we can do. A recommendation: Read the last chapter first .. “The flute player: What should an open society do?” It will enrich not spoil your reading. … deliberately assumed the calm sober language of the witness, neither the lamenting tones of the victim nor the irate voice of someone who seeks revenge. I thought my account would be all the more credible and useful the more it appeared objective and the less it sounded overly emotional. Only in this way does a witness in matters of justice perform his task, which is that of preparing the ground for the judge. The judges are my readers. We must raise up these narrators as heroes … to bear witness, to tell the reality of life in these isolating, secretive, dangerous and unbearable situations, to speak both for themselves and for those who are unable. … to hold to account the perpetrators, to prevent others experiencing the same thing. These are the heroes of totalism. We must listen … [to] give each person an existence, allow them to be seen. 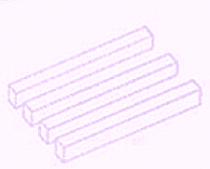 In isolation one cannot be seen. At every level, Alex Stein is a hero too. Her book tells us how she has comprehensively survived, studied, thoroughly thought through and achieved that state of humane but objective witness for the largely still ignorant world to judge. To do this is a truly heroic work because those coercive relationships set out to destroy in those they take in the very capacities required to be a useful witness and live to tell the tale. Alex Stein’s deep work and her graceful book are superb narratives of science, humanity and art. She gives us a new and essential core to our field and to the world. The book is a gift for any reader. Do read it. 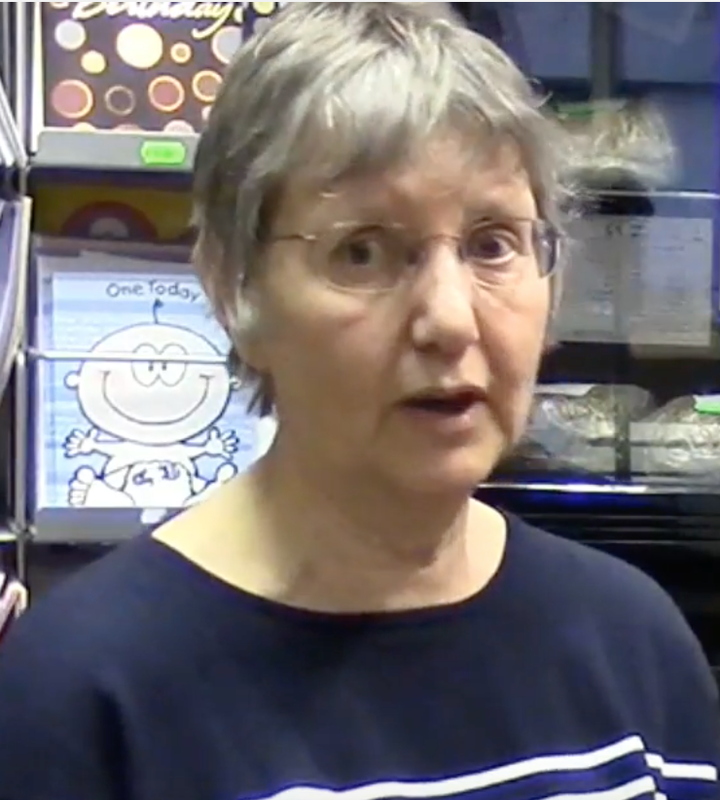 Then you’ll want to read much more of Alex and her work on her website – try her Warning Signs – and hear her talking about her book and about prevention. Excellent book indeed. In the last chapter, “The Flute Player,” Dr. Stein discusses the idea of Narrative Therapy. This is perhaps one of the better ways we know of yet to ameliorate Attachment Disorders/Trauma in adults, a problem which is at the core of Attachment-based Parental Alienation. That is a tall order. Potentially, an inexpensive and effective way to start self-therapy for this issue. Thanks for this Anne. I think there are different approaches that take the name Narrative Therapy. And there are dozens of great Attachment based approaches that very much use narrative as part of their assessing and therapy. These other approaches are, dare I say it … for those avid followers who, as I do more moderately, see a lot of value in his work … even better than Dr Craig Childress’s rather scary loud and drum-beating one! However, I am certainly interested in your links to Jordan B Peterson and to Dan Seigel. Thanks again.